Protestors rally against H.B. 318. Photos by Kaitlyn Barlow. Last Tuesday, the North Carolina legislature approved H.B. 318. 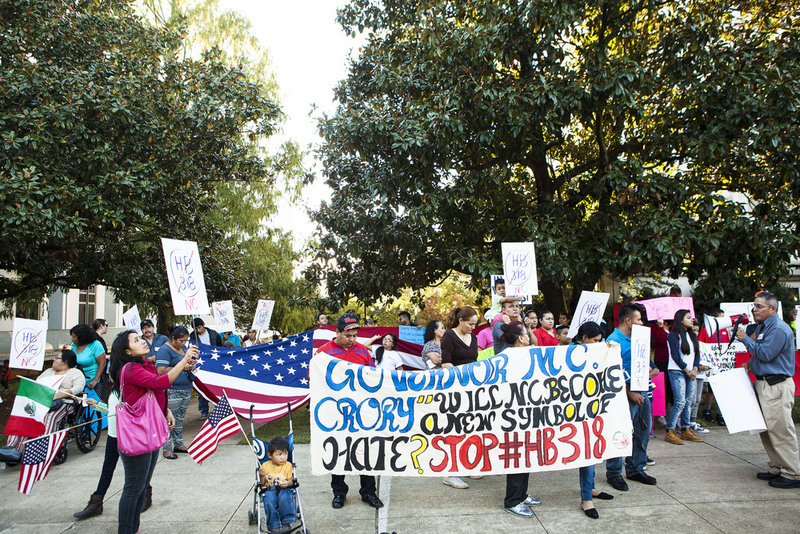 Dubbed the “Protect North Carolina Workers Act” by its supporters, this bill constitutes an immediate and grave threat to immigrant communities and the working poor in North Carolina. Since the bill’s late-night passage, advocates against the law have been calling on North Carolina Governor Pat McCrory to veto the law to prevent its enactment. I want to name that bill for what it is: another step in the North Carolina legislature’s war not just on immigrants, but on the working poor and communities of color in general. Buried in the nativist language of the bill itself are a variety of provisions intended to make day-to-day life more difficult for unemployed North Carolinians and undocumented people. The worst of these provisions can be separated out into two main categories: a ploy to oppose “sanctuary cities” by criminalizing all undocumented people, and attempts to withhold federal assistance from childless, unemployed adults. Let’s tackle them in order. If signed into law, H.B. 318 will prohibit police officers from accepting forms of identification which are not issued by the state. Consular IDs, cards issued by local municipalities, and identification provided by community organizations would all fail to meet this standard, requiring police to arrest anyone who attempted to prove their identify by carrying them. Additionally, the bill would require all employers to check the immigration status of their workers by running their information through the federal government’s E-Verify system. Rather than advancing public safety, these provisions undermine it. Under these new requirements, state law would strip local police departments of their discretion when prioritizing individuals for detainment, trial, and incarceration or deportation. By forcing police officers to run additional ID checks and treat law-abiding undocumented people as de facto criminals, the bill takes resources away from the enforcement of laws against violent and more serious offenses. Moreover, by instilling fear in immigrant communities that they very well “might be next,” this bill sows distrust and will likely lead to immigrant families thinking twice before calling the police or reporting crimes, illegal harassment, and intimate partner violence for fear of being arrest themselves. Far from making communities safer, this bill would lead to rampant distrust of police, making already vulnerable communities even more susceptible to violence. And none of this is likely to significantly curb immigration to North Carolina. The underlying trends are too powerful: the foreign-born population in North Carolina increased 274 percent during the 1990s and by an additional 74 percent from 2000 to 2010. Rather, these provisions will force immigrant communities already living in North Carolina to live in a state of near perpetual fear of each other and their local police. As if all this weren’t enough, H.B. 318 restricts access to food for people most in need. Under H.B. 318, the state would be barred from requesting waivers which allow childless, unemployed adults to receive benefits under the Supplemental Nutrition Assistance Program (SNAP), formerly known as “food stamps.” Under current law, adults who fall into this category and meet a certain set of requirements are only allowed to access SNAP for three months in any three-year period. However, recognizing that the Great Recession and a host of other factors have led to an increase in the chronically unemployed, states have generally applied for waivers to extend those federal benefits longer. If passed, H.B. 318 would cancel North Carolina’s existing waiver applications to the federal government and ban the Governor from ever requesting them again. Now, it’s worth noting that North Carolina has applied for waivers to extend these benefits for 77 out of the state’s 100 counties and that in 83 counties, the numbers of unemployed North Carolinians exceed the number of jobs for which employers are hiring. By making it more downright impossible for unemployed people to access $150-$180 dollars of federal support each month, this bill is taking money out of the pockets of the working poor and making it harder for them to feed themselves and their families. Sadly, legislators seem to believe that reducing federal benefits will compel low-income people to work longer and harder. But that’s just not true. In fact, we know that most people receiving these benefits are working and want to work more; they’re simply unable to. Moreover, this belief obscures the fact that, while withholding public assistance, legislators in Raleigh have also systematically divested from workforce development and job training programs, cutting budgets for these initiatives by 10 percent since 2008. In addition, the state has failed to take advantage of federal dollars allocated to the SNAP Employment and Training Programs, with only seven counties offering subsidized support to North Carolinians in need. Taken together, the SNAP provisions of H.B. 318 represent the clear and total abandonment of low-income people seeking work and trying to feed themselves. It is hard to fathom how the legislature could reduce jobless benefits while simultaneously making it harder to find a job at all. It might seem as though these two themes—anti-immigrant sentiment and restrictions on public benefits—run parallel to each other more often than they intersect. Yet these policies share a common point of origin: the inability of North Carolina’s lawmakers to empathize with those struggling at the margins of society. Surely one of the most fundamental moral lessons we all learned growing up was that we had a clear obligation to treat others as we would have them treat us. It seems to me that this obligation requires us to offer food and social assistance to those unable to provide for themselves, to create structures that welcome and embrace new neighbors rather than requiring their incarceration, to cultivate a community of trust and mutual understanding across lines of social difference. In this light, the supporters of H.B. 318 prove themselves willing to shirk their responsibilities to provide for the welfare of all North Carolinians, and to oppose common-sense moral intuitions regarding community and mutual aid. Want to understand how white supremacy works on the everyday level? Look at what happened to the first (and only) Black, queer, woman-owned brewery in North Carolina. Amazon is making a big deal out of looking for a spot for a second headquarters, and cities are taking the bait. But in places like Atlanta that are already struggling with gentrification, not everybody wins. After awhile, people get tired of being treated and talked about like a remainder in a market model. So rebuilding the left will require more than spouting off more statistics and esoteric policy jargon.